Sometimes great things happen but never get any shine Lance Baressi, the owner of Permanent Records in LA and Chicago, came to me with an idea to give some killer tracks he’s come across in his digging for records some shine. There is loads of Hendrix, Zepp, Stones, Sabbath, Skynard, worship included in these tunes, but it’s not just “Sounds Like” material, there are a lot of great bands that for whatever reason never got the shine they deserved. Could have been that they had a 300 lb front man that a label couldn’t market, or maybe it was a one off single. The title of the series is BROWN ACID. 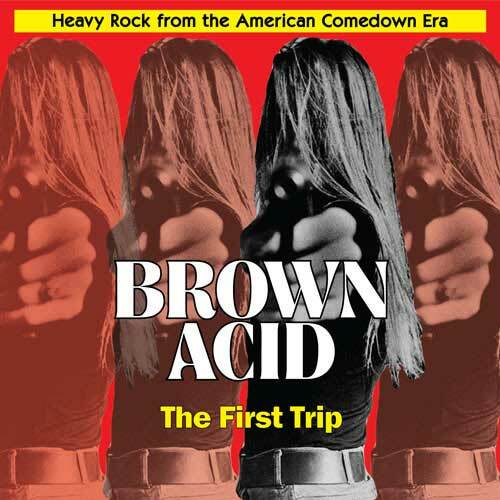 The first installment BROWN ACID – THE FIRST TRIP is out worldwide August 25th. We have enough tracks for 3 trips at the moment and the goal is to do 5. These are all properly licensed, bands get paid and not boot legs like most of the comps that are getting passed around for this genre. Here is the official press release about the project, we look forward to making sure your life is a bit more psychedelic. Compiled by Lance Barresi and Daniel Hall.